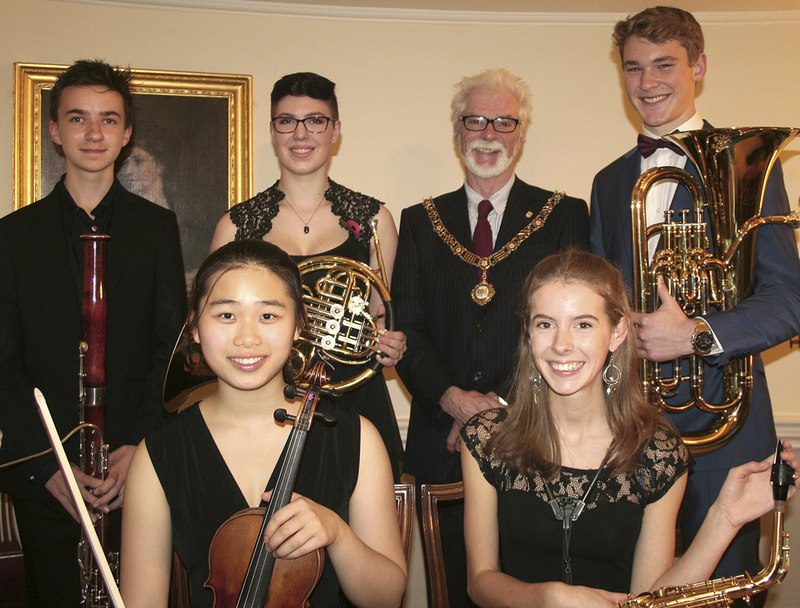 This was another very inspiring concert at the Pump Room, emphasising how high the standard of musicianship is continuing to be maintained, in spite of the large cuts to education, as mentioned by the Mayor. Janet Read, Music Chairman of the Mid-Somerset Festival, welcomed Patrick Anketell-Jones (Mayor of Bath), Cherry Beath, (Hon Patron of the Mid-Somerset Festival), and Paul Roper of the Roper Family Charitable Trust, principal sponsors of the Mid-Somerset Festival, who presented prizes to all contestants. There were 5 different musicians – French horn, bassoon, violin, euphonium, saxophone, and the adjudicator said that they were graceful, appealing, cultured and elegant in their performances. The judges agreed unanimously on the winner, Katie Bunney (saxophone), who played a variety of music, ‘Canzonetta’ (Pierné), ‘Dreams of You’ (McGarry) and the well-known ‘Czardas’ (Monti). Katie played in the Wiltshire Youth Jazz Orchestra and is now the principal saxophonist of the National Youth Wind Orchestra. 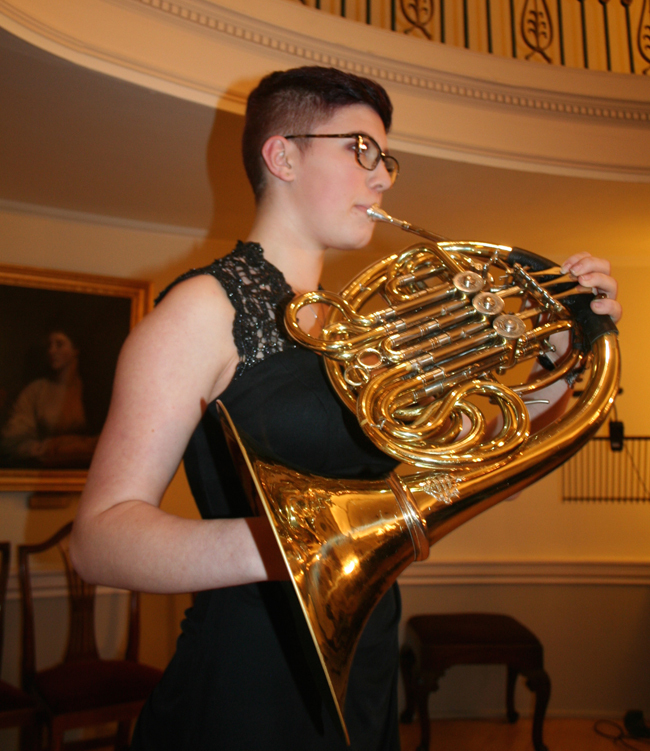 Rosalie Luff (French horn) played Franz Strauss’s ‘Horn concerto opus 8’. She has been a member of a number of orchestras, including Bath Schools’ Philharmonic Orchestra. 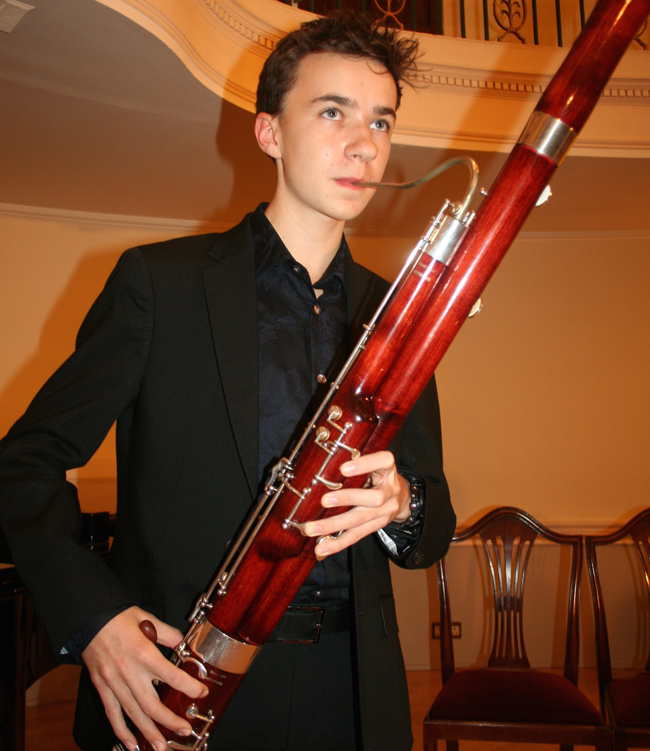 Xavier Raynes (bassoon) was a member of National Children’s Orchestra. Xavier first competed in the Mid-Somerset Festival at the age of 4 (!) in a piano duet with his sister. At this concert he played contrasting music from JS Bach –‘‘Cello suite no. 1’ (arranged for bassoon) and ‘Summertime’ by Gershwin. 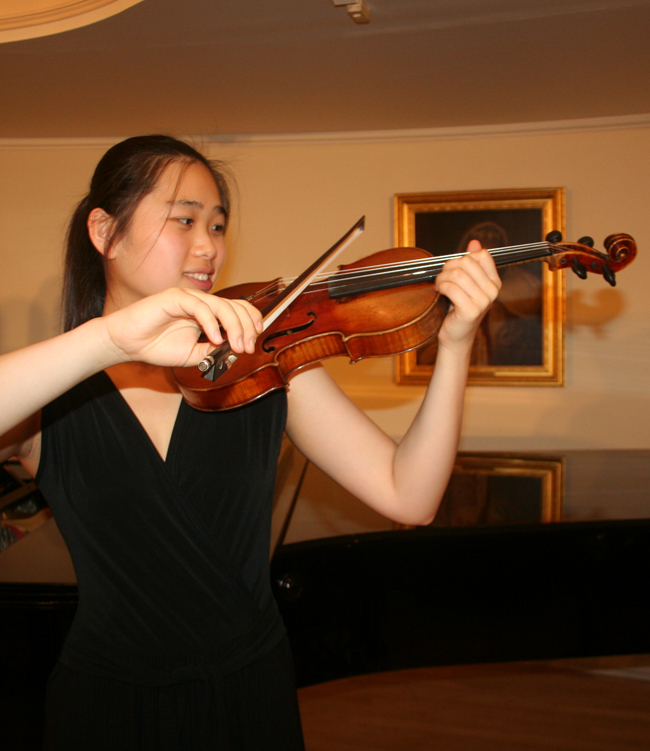 Christie Yau (violin) performed the modern Lutoslaki’s ‘Subito’ and Tchaikovsky’s ‘Meditation’. Christie has played the violin for 10 years now and appreciates the international support from her family and her teacher. Joshua Lacey (euphonium) played an adapted ‘Andante’ (originally for double-bass) by Capuzzi, ‘Romance’ by Karl Jenkins and ‘Glorious Ventures’ by Peter Graham. Joshua is a member of the BANES Symphonic Wind Band and Brass Tacks. While the judges were discussing the order, last year’s winner, Rachel Stonham (violin), returned and gave a performance of varied music by Ravel, (title ‘Blue’) and Suk (‘Burlesque’) and her playing reminded the audience of her wonderful performance and win last year. On November 17, she will be the soloist in the Sibelius Violin Concerto with the Trowbridge Symphony Orchestra. It was a wonderful evening, and all music lovers are strongly recommended to come to the future Mid-Somerset Festival concerts. This was another marvellous concert at the Pump Room, emphasising how the high standard of musicianship is continuing to increase. 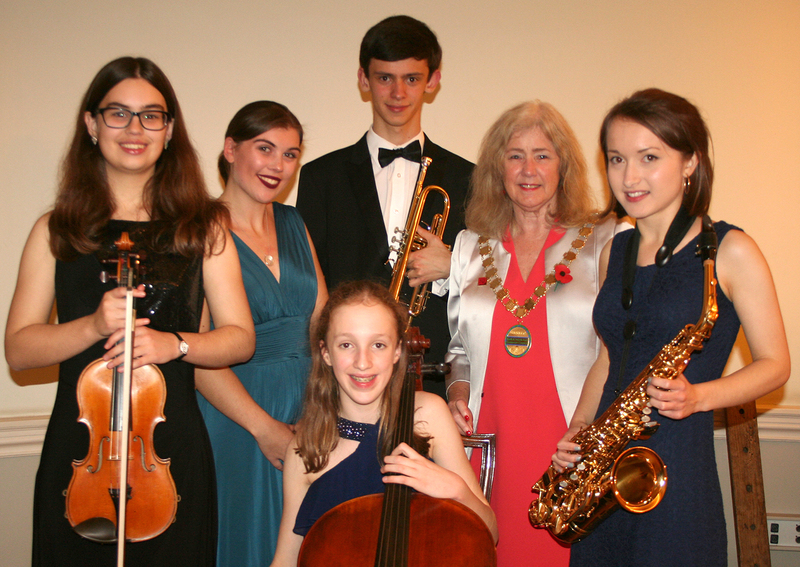 There were 5 different musicians – ‘cello, soprano, saxophone, trumpet and violin, and the adjudicator said how the audience had been almost transported around the world with the wide variety of music performed. The judges were looking for consummate musicianship, different ‘colours’ and nuances in the music, with confidence and good communication. Janet Read, Music Chairman of the Mid-Somerset Festival, welcomed Ian Gilchrist, Mayor of Bath, Cherry Beath, Hon Patron of the Mid-Somerset Festival, and Paul Roper of the Roper Family Charitable Trust, principal sponsors of the Mid-Somerset Festival, who presented prizes to all contestants. 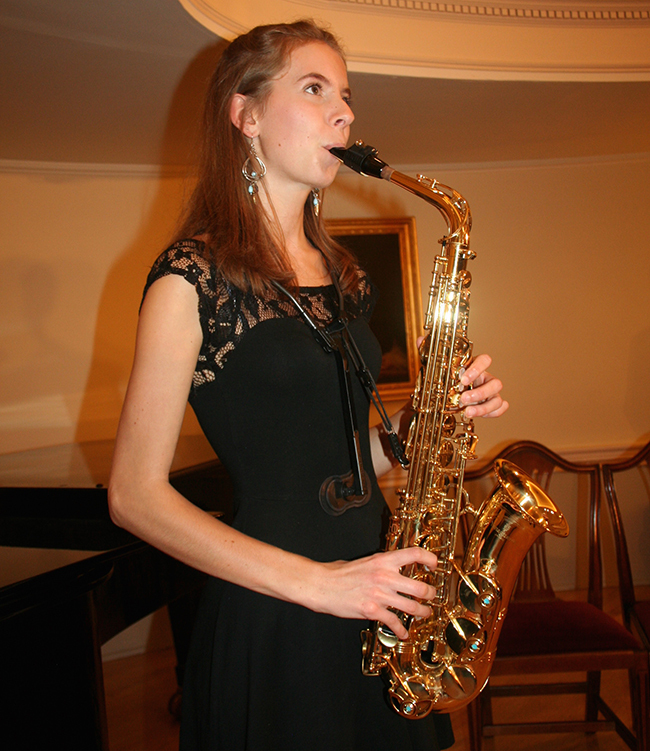 Nicole Micheli (saxophone) played Heiden: “Sonata” and Milhaud: “Scaramouche”. She is a member of the Wiltshire Youth Jazz Orchestra and also the National Youth Jazz Orchestra. Her variety or music was very well controlled, with lots of contrast of volume and ‘smoothness’ and staccato. 12 year old Freya Hyde (‘cello) played Romberg: “Sonata in E minor”, Saint-Saens: “The Swan” and Squire: “Tarantella”. Freya enjoys participating at music festivals, concerts, charitable events and National Children’s Orchestra and her control of the vibrato and tuning of the lower string instrument was excellent. Martha Meager (soprano), sang “I could have danced all night”, “Pulled”, “With You” and “Some People”. Martha attended Bristol School of Performing Arts from 2010-2015. Her recent productions have included Les Miserables, Annie and Aladdin. She also sang a wide range of different songs and acted well to engage with the appreciative audience. Wesley Downing (trumpet) also competed in this concert last year. This year he played Rimsky-Korsakov: “Flight of the Bumblebee”, JGB Neruda: “Trumpet Concerto” and Zequinha Abreu: “Tico Tico” The first and last were incredibly fast and exciting, and the concerto was thoughtful and lyrically played. He has played in BANES’ ‘Brass Tacks’ for nine years, and, as a member of many groups, he has had the opportunity to perform in the Royal Albert Hall for the Schools Proms. While the judges were discussing the winner, last year’s winner, Katherine Stonham (piano), returned and gave a thoughtful performance of a Sonata by Antonio Soler and ‘Pagodes’ by Claude Debussy. The unanimous winner, Rachel Stonham, 16-year-old violinist from Trowbridge, played Beethoven: “Sonata 1”, Paganini: “Sonata 12” and Arnold: “Five pieces-Moto perpetuo”. Rachel enjoys solo and orchestral music, playing with National Youth Orchestra, local Youth Orchestras and Trowbridge Symphony Orchestra. Even while having to control the sensitive violin, with her double-stopped music from Paganini, and the rapport with her accompanist, her eyes were acting out the music and she communicated superbly with the audience. In November 2017 it will be thirty years since the first Bath Young Musician of the Year contest when Liam Gribbin (flute) won the event. Since then it has been held every year, except 1988. Finalists for this event are selected from those who have done very well in their vocal or instrumental classes in the previous March Mid-Somerset Festival. Competitors must be under 21 and live or study in Bath or within a 15 mile radius of the city.